Rangers have changed a lot in the last few years. Despite what some in this world would have you believe, the club born in 1872 remains intact, along with the glorious history of Scotland’s premier club. The club is still changing. A bitter boardroom struggle hangs over Rangers and dominates the headlines and discussions of the supporters. The annual accounts were released on Tuesday and it confirms the fears of many – Rangers are not performing well financially and the outgoings at the club are far too high. But the team is one that is constantly changing, also. Last season’s Third Division campaign was one to forget. We’ll never quite know why the team had so many awful results and so many abject performances that embarrassed the great name of Rangers. After the chaos of the 2012 spring and summer, where demotion to the fourth tier and the loss of so many of the club’s top quality players left the squad extremely bare, manager Ally McCoist brought in some players. First, he had to wait for more off-field wrangling to end before he could start. The transfer of membership to the new company was only granted hours before the first game against Brechin City in the Ramsdens Cup. The SFA’s registration embargo started on 1st September so McCoist had a month to bring in players for the challenge ahead. The signings of SPL-standard players like Ian Black, David Templeton, Dean Shiels and Fran Sandaza were given a warm reaction from fans – it was the signings they wanted to see and no-one complained much at the time. A few other random foreign additions were made and were added to the loyal players who stayed for the fight and the club’s youngsters. As the season went on, fans were questioning the attitudes of the experienced players assembled. Looking back on the campaign, it was one where we won a league title by 24 points yet had so many terrible weekends. Elimination from all three cups left a sour taste in the mouth. In league terms, Rangers would win a game by a healthy margin yet the supporters would leave the stadium thinking it was a close victory, such was the level of entertainment on offer. The performances from some of the emerging young players gave Rangers fans a wry smile. Lewis Macleod slotted into central midfield like he had been playing there for five years. The boy has a bright future for club and country. Others like Fraser Aird, Barrie McKay, Robbie Crawford and more got their chance and did well in exceptional circumstances. Moving forward to this season and the squad has completely changed yet again. With the embargo running up till September 1st of this year, McCoist was forced to bring in only free transfers and play them as trialists in drips and drabs in August – and nine arrived through the doors at Ibrox. A total of nine have left the 12/13 squad (not including loanees in 12/13 Dorin Goian and Carlos Bocanegra) so the large pool of players remain. With that, you get a large wage bill and one that many disagree with for Scotland’s third tier. But financial matters put to one side, the large squad definitely gives a greater amount of competition for places. There is quality in every position at Rangers now, along with a productive blend of youth and experience. Whether that youth is allowed to grow and flourish this term is for another article. McCoist often bemoaned a “threadbare” squad last season whenever a few players from the first team were injured or suspended – that is not an excuse the gaffer can use this time around. At the time of writing he has a chief executive in the form of Craig Mather who has given him what he wants in the transfer market – the opposite to how Charles Green operated last August. This is very much Ally McCoist’s team. In that sense, this is his golden season to make a stand. 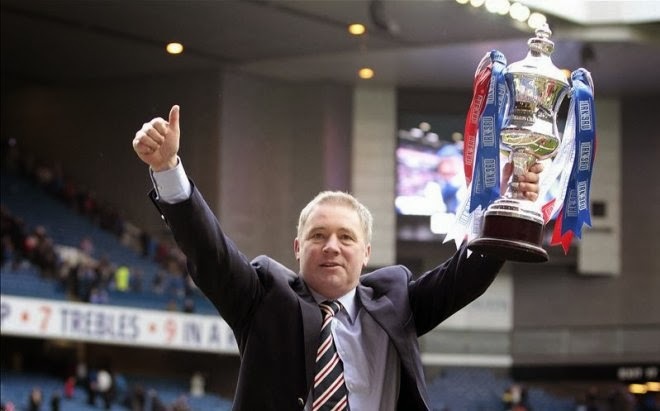 Already out of the League Cup to Forfar, McCoist has to deliver at the very least a League One title coupled with a Ramsdens Cup and a long run in the Scottish Cup. Some may say that’s high expectations for a League One outfit – others would point to the second highest wage bill in the land and the fact that this is the Rangers we’re talking about. The signs are promising. Summer recruits like Nicky Law, Jon Daly and Nicky Clark have contributed to a storming start to the league assault with seven wins out of seven resulting in Rangers claiming to be the only team in Scotland with a 100% league record. With just two goals conceded and 32 goals scored, it’s a complete change from the Third Division dross. The last game resulted in a whopping 8-0 defeat of Stenhousemuir, new signings Jon Daly (4) and Bilel Mohsni (1) getting on the scoresheet. The last four has been reached in the Ramsdens Cup and you would expect the team to go on and lift that now. The team is clicking together and perhaps finally we are all seeing the Rangers we expected to see move through the leagues on the way back to the summit. The Scottish Cup has yet to feature any of the league clubs but expectation will be high amongst the Ibrox faithful. The pitiful surrender to Dundee United last year still sticks in many throats – let’s see how we fare in the national tournament with a far better pre-season under our belts, some quality additions and a much better shape about the team going forward. If teams like Kilmarnock and St Mirren can go all the way in the League Cup, why can’t Rangers go all the way as a present League One outfit in the Scottish Cup? We can but hope. Serious investment will be needed on the club’s return to the top-flight to challenge a far superior Celtic on and off the pitch – it has to happen and realistically every Bear will think the same. But for now, the signs are encouraging and at least on the pitch the team seems to be building the necessary blocks to progress forward through the divisions. Unity, stability and intelligent forward-thinking is needed at boardroom level first before any proper club progression can be properly achieved and hopefully that comes in the next few months. The challenge ahead remains a painfully hard one but Rangers will get there. We can all raise a glass (or ten) when we achieve title number 55 and look back on this sorry period in the 141-year history of Rangers and have a chuckle. For now, horse on lads.